Developing, gathering and recording knowledge regarding quality assurance and medical screening optimization. Those are the LRCB core activities. But it is also important to share that knowledge. Our knowledge net contains (references to) standards, regulations, procedures, protocols and hand-outs. Copyright applies to this information. It is illegal to publish or duplicate this information without LRCB approval. For quotes, source acknowledgement for the user is required. Much of the LRCB knowledge is shared within Europe. The Dutch Guideline for Breast Cancer, version 2.0, was published in February 2012. It is possible to order a poster or book for more information about positioning technique. The LRCB compared the F.A.S.T. paddle (flexible) and the standard paddle (rigid). 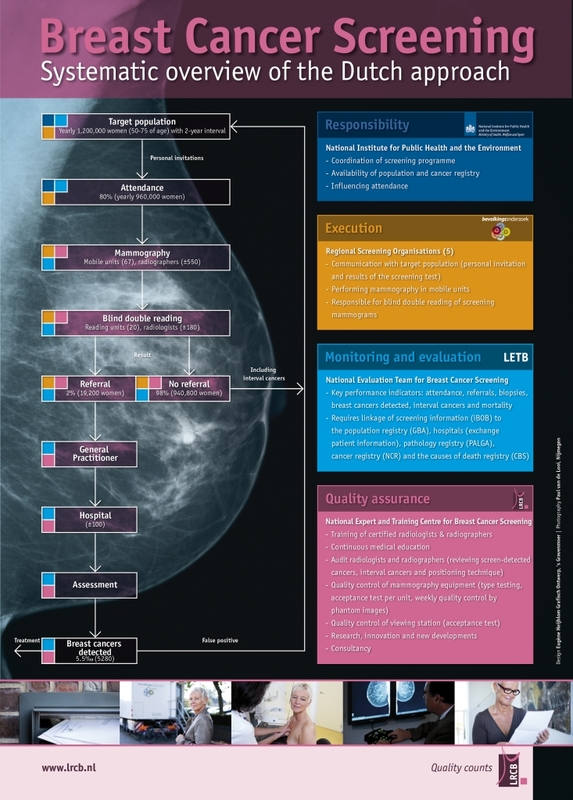 A poster is available, giving an overview of the Dutch breast cancer screening programme. For questions or more information please feel free to contact us by using our general contact form.